Imagine, a looper that just loops; simple to use, no amp models to mess with your sound, no tone controls, no drum tracks, no effects, just one button and a volume control. In our ever increasingly complex world – no chance! But wait; what’s this? 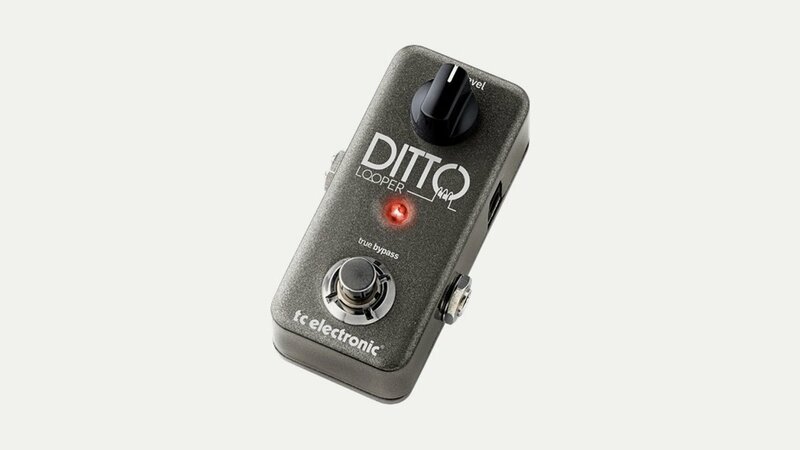 The Ditto Looper by TC Electronics. Billed as a looper ‘designed by guitarists for guitarists’. Have they cracked it? This thing is tiny being just a little wider than a Mooer micro pedal and fits easily into your pocket. As a consequence it has no battery compartment and needs an external DC power supply. It has a sturdy metal case, a footswitch and loop level volume knob – both of which feel solid and built to last – and an LED which glows red or green and that’s it. The footswitch controls everything and the handy (very small) quick start guide included tells you what pressing it does and that’s all you need really. You can download a full guide from the TC Electronics website if you wish for more information on the pedal and looping tips. I have a Line 6 JM4 Lopper which is a fantastically versatile, yet complex, practice and performance tool with 12 amp models inbuilt and over 200 drum and song tracks to use together with loads of effects and tone controls. I have spent hours playing with this and recording loops/songs – you can plug a mic in as well if you wish – and you don’t even need an amp as you can use headphones. A great tool? Yes, but with one huge flaw; you can’t use your sound as it has no bypass and my Egnator amp doesn’t like it (you need to put your amp controls to flat and turn off the gain for it to work) so the tone I have spent hours perfecting I can’t use! No such problems with the Ditto as it has true bypass. Whatever you put in it comes out sounding the same – it just loops. Marvellous! Easy to use? Yep; plug it in, glance at the quick start guide and off you go – it’s that easy. Press the footswitch once to record (the LED glows red), again to stop recording (the LED goes green on playback and ‘blinks’ when the loop starts again), press again to add another part (the LED goes red) etc. There are no limits to the number of dubs you can add to the loop and we added ten in a few minutes with no loss of sound quality. Press and hold the footswitch to delete your last dub (the LED blinks twice) and if you want to re-add it press and hold again. Press it twice quickly to stop the loop and to delete it press it twice and hold it down. Simples! Putting a few effects pedals before the Ditto means you can add layers of different tones to your loop. It is so easy to use straight out of the box that you feel that there must be a catch. The only downside is that if you want to save your loop you will need to record it on a separate device using an interface or a mic. The Ditto will save your last loop when you turn it off for playback next time but you can’t save them long term.